Living is easy these summer days, isn’t it. Although I disliked water melons a lot when I was a child, these fruits are ever since some kind of synonym for summer to me – because they are omnipresent once temperatures are rising. Everybody seems to love water melons, and nowadays, I do so, too. There have been countless inspirations on the blogosphere recently what to do with it besides cutting into triangles and eating just like this. Today I want to contribute to the water melon recipe collection as well with a very simple antipasti treat. Doing so, I also want to make a further contribution to Uda’s and my olive herb mini blog event. If you would like to joins us, there’s still a few days left. We will be very happy about your contribution! I am most lucky that I have been given the opportunity to pass the next two weeks in this space, thanks to a friend whose atelier I may use for some food photography experiments among canvases, scaffolds and a beautifully bewildered area. How exciting is that! – although I already fear that I will have not a single photo shooting idea given the intimidatingly big input of creativity that will await me there. Read (and see) more, soon – about the space, about my friend’s art and (if anything goes well) about my attempts to prepare some salad according to a painting. This one is so easy that you hardly need a recipe. 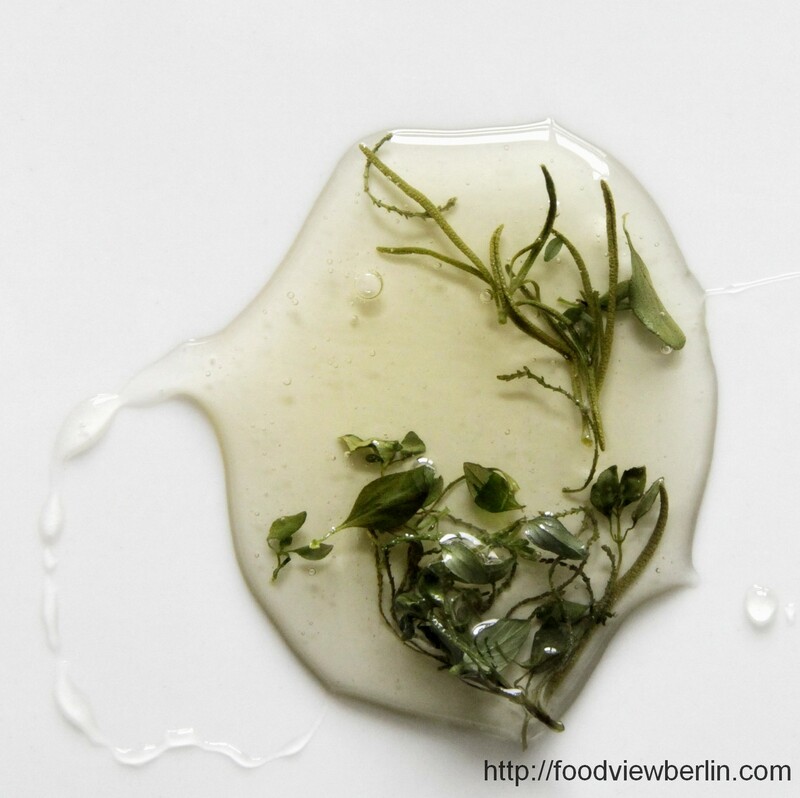 Take a small handful of fresh olive herb, rosemary and lemon thyme, clean and roughly cut into not too small pieces. Mix with about 150 ml honey – I would recommend a subtle honey, not a heavy weight like wood honey. Let aromatize for a couple of days. 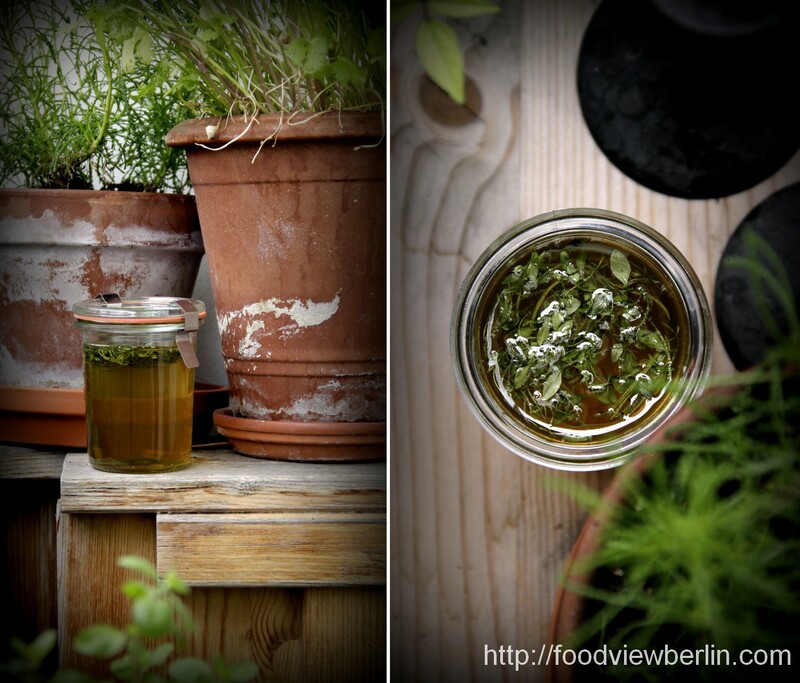 After this procedure, you can either leave the herbs where they are or pour the honey through a sieb into another jar (and the herbs will stay in the sieb). Prepare the antipasti: roast some pine nuts in a dry pan, put aside. Cut a piece of smoked cheese into quarters. Scamorza affumicata will be fine, but you can take any other sort as well. Cut a piece of water melon and of galia melon into quarters of the same size. Mix honey and balsamic vinegar of good quality 2:1, pepper to taste. 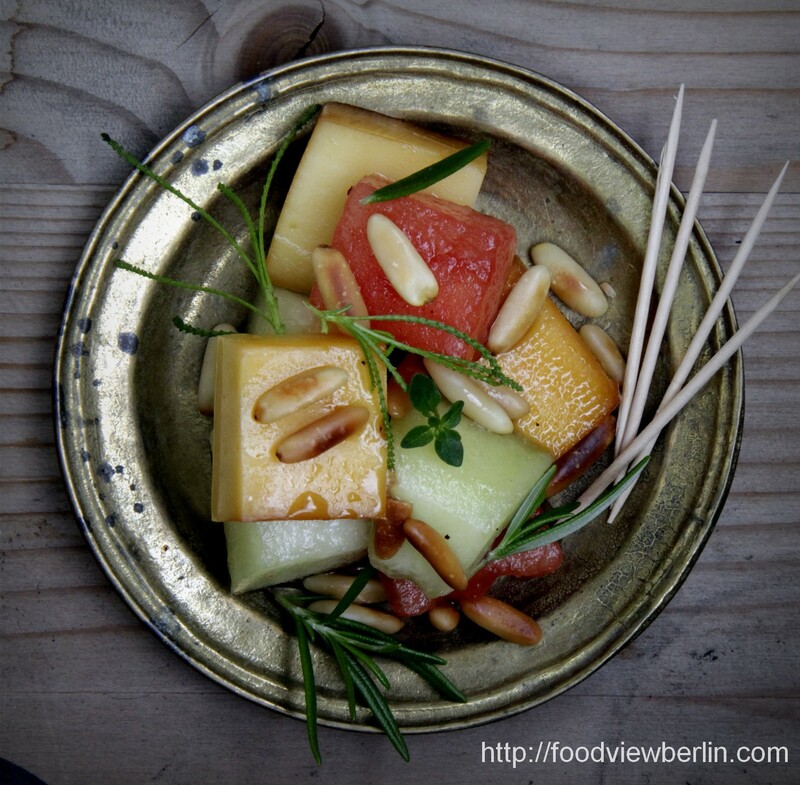 Mix the cheese and the fruits with it, arrange on little plates and decorate with fresh herbs and pine nuts. Enjoy with some baguette and a glass of Pastis. Thank you, Antje! It took me some time as well to warm up to watermelon. Galia Melon and coconut sounds wonderful (althouh I can imagine what you mean with a suboptimal consistency ;-)), as well as grilled watermelon – I have to try especially the latter. This place looks just amazing. I love the idea of urban farming and bee keeping! I am not really a big fan of melons but I will give it a try soon. Your last pic of the salat just looks so inviting. 🙂 And besides what else would one want to eat other than salads right now. I always stand in the 28°C kitchen in the evening asking myself what I want to eat… salad is the only option. Greek last night. And maybe melon today! Have fun in the atelier! Thank you, Eva! I just returned from this gorgeous place, it’s most inspiring. You are so right – salad (and fruits) is the only thing one can prepare right now without collapsing in the kitchen ;-). I’m sure your Greek salad has been most delicious. What a nice idea to treat honey like this. We just tried the ubiquitous watermelon with feta cheese – but your idea is so tempting…..
It’s worth a try – the honey get’s a nice touch indeed. Watermelon and feta cheese is surely wonderful as well! I did something similar in the atelier today, soon on the blog. Thank you, Julia! Wow, you have plans to be a beekeeper some day? That’s gorgeous! We also read a lot about urban beekeeping, and we found out that, in some regions, it’s an important contribution to the maintenance of bee colonies in general because bees find a big variety of flowers in the city and are less confronted with agricultural pesticides. Thank you! Es ist ja noch ein bisschen Sommer übrig, vielleicht wird das ja also doch noch was mit Pastis und Bienenschauen ;-).